I will be doing a gallery talk at the Sam Noble Museum on Sunday, June 24 at 2:00 pm in the Higginbotham Gallery, which is where the exhibition Putting Baskets to Work in Southwest China is now on display. Everyone is welcome! Anyone who loves, for instance, river cane baskets (Cherokee, Choctaw, Creek, etc.) will enjoy seeing these bamboo work baskets. There is way too much stuff going on in my life and work these days. Most of it is really good stuff, but it is hard to keep up. Before moving on to new reporting, here are some good news highlights from recent weeks. Colleagues and I shepherded into print the 50th volume (=golden anniversary) of the Journal of Folklore Research, for which I serve as Interim Editor. JFR 50(1-3), a triple issue (! ), is a special one titled Ethnopoetics, Narrative Inequality, and Voice: The Legacy of Dell Hymes and is guest edited by Paul V. Kroskrity (UCLA) and Anthony Webster (Texas). The guest editors contributed a post about the issue for the IU Press Journals Blog and the triple issue itself is can be found on the Project Muse and JSTOR digital platforms. Thanks to all who have supported JFR over its first five decades. In September, two scholars whose Ph.D. committees I chaired finished their doctorates. Congratulations to Dr. Flory Gingging and Dr. Gabrielle Berlinger! I noted the award quickly previously, but I had a great time attending the Indiana Governor’s Arts Awards where Traditional Arts Indiana, led by my friend and colleague Jon Kay, was recognized. A while back, the Mathers Museum of World Cultures opened a fine exhibition curated by IU Folklore graduate student Meredith McGriff. It is Melted Ash: Michiana Wood Fired Pottery and it is a sight to behold. If you have not seen it, stop by the museum and check it out. The very talented Bethany Nolan was kind enough to talk to me about Yuchi Folklore and to write about our discussion for her Art at IU blog. The Euchee (Yuchi) Tribe of Indians just held its 17th (!!!!) annual Heritage Days festival. A few years ago a Miss Yuchi/Euchee was added to the festivities and the young women chosen have been great representatives of their nation. This year another awesome young woman was selected. Congratulations to A.S. on being selected for this big honor and big responsibility. This is an update on the bad news side of my post from yesterday. The tweet that I described and then described as disappearing was made by a student who has now been arrested on a preliminary felony charge of intimidation. 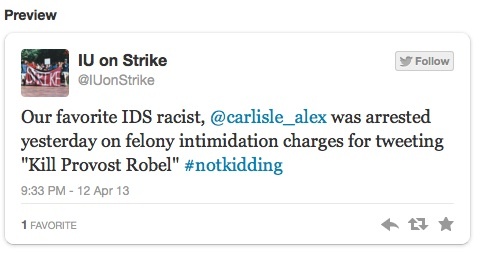 This has been reported publicly now by Bloomington Herald Times reporter Abby Tonsing. I support free speech, but rights come with companion responsibilities attached. Rights are talked about indignantly a lot right now, but I wish more attention was being paid to responsibilities, particularly to one’s neighbors. On the good news front, students, faculty, staff, and friends associated with the Mathers Museum of World Cultures continue to come together to do good work and illustrate why museums are good places to gather, talk, think, study, and try to make a difference. As I move into my fourth month as the museum’s director, I feel so thankful for everyone’s interest in, and support of, the museum’s efforts. Here are some highlights from recent days. Last Saturday the museum hosted a great “Meet the Collection” event. The focus was the museum’s collection of handmade chairs by Chester Cornett. This collection was assembled by folklorist Michael Owen Jones during his doctoral research at Indiana. Some chairs came to the museum at the time of Jones’ initial student research, but others were recently donated by this now distinguished UCLA scholar. Jon Kay, James Seaver, and Ellen Sieber all contributed remarks that led to a wider group conversation to which Joanne Stuttgen, Pravina Shukla, Henry Glassie and others contributed valuable questions, observations, and historical reflections. More good news at the museum was reported in the latest issue of Inside IU Bloomington. Bethany Nolan wrote a great article profiling the work the students in my Curatorship are doing studying the ethnographic collection given to the museum by the late Vincent and Elinor Ostrom. The quotes that the students gave Bethany would be music to any teacher’s ears. Alumni of this graduate course are now doing great things as museum professionals and it is exciting to teaching it again, particularly in a spirit of hopefulness. Public folklore and museum anthropology–these are fields that have roots that extend back to the time before the fields became rooted in academia. They were alt-ac (ie. alternative to academic careers) before these fields even had an “ac” track. As neighboring humanities disciplines begin (sometimes for the first time and in a spirit of panic and despair) to seriously consider non-academic careers for their graduate students, it is great to point to a deep tradition of engaged research-based public humanities work in museums and to be able to illustrate the skills required and the path ways that can be taken. It helps to have role models. 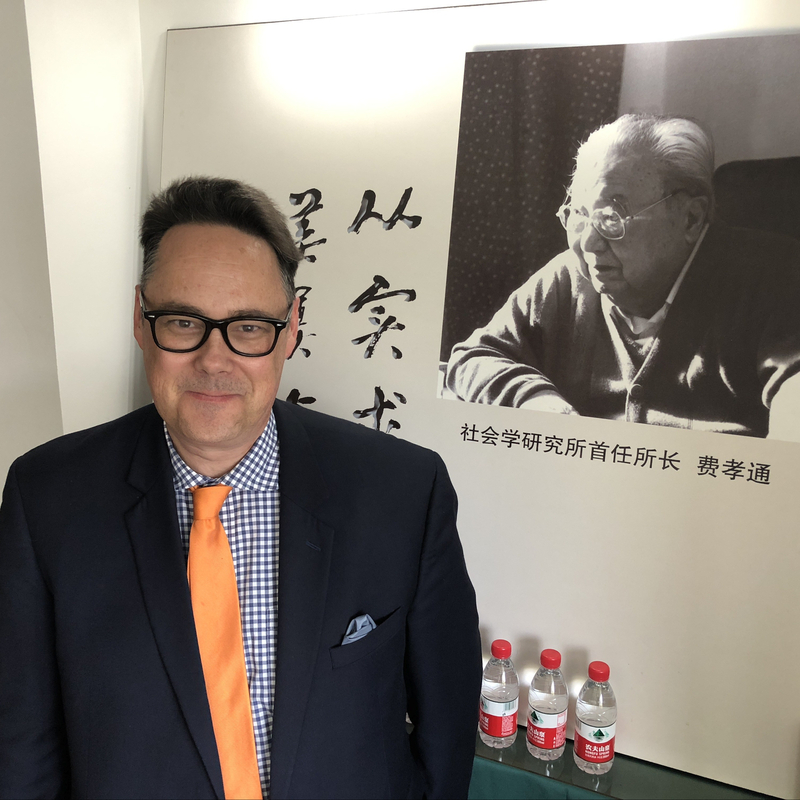 A graduate of my department, Michael Mason, has just been named Director of the Center for Folklife and Cultural Heritage at the Smithsonian. He is moving over to this new leadership role from the National Museum of Natural History, also at the Smithsonian, where he has been serving as Assistant Director for Exhibitions. (Read all about it in a recent Smithsonian press release.) I do not want to get ahead of the institution that has just hired her, but a current student in my department has just been hired into an impressive postdoctoral fellowship aimed at bridging academic and museum work in New York City. At the other most distinguished end of the career spectrum, one of our department’s most innovative and impactful graduates is Barbara Kirshenblatt-Gimblett. Barbara is in the news constantly now because she is playing a central role in the development of the (soon to open) Museum of the History of Polish Jews. As core exhibition designer for the museum, she is drawing upon all the lessons she has learned over an amazing career as a Jewish ethnographer, cultural theorist, museums studies specialist, public folklorist, and NYU professor of performance studies. Reporting on the (incredible) museum (to be) and her work is ubiquitous, but one can dip into it in a recent Tablet magazine story “Curator of Joy and Ashes” to gain a sense of the amazing effort. Back home at the Mathers, I feel like we are having success. In the American Folklore Society’s response to the RFI, the society did two things of note. The AFS pointed to, and endorsed the careful and valuable submission that had already been made by the Association for Computers and the Humanities. In addition to supporting public access policies, the ACH statement (and by extension the AFS view) stresses the need for research policy makers working on this (and neighboring issues) to keep humanities research in mind as part of the larger (and relevant) research landscape. The other theme brought out in the AFS statement is that the society has committed itself to sustainably pursuing public access goals as exemplified by its adoption of an author agreement for the Journal of American Folklore that is consistent with green open access practices (including repository deposit of the publisher’s final version) as well as its work (with the IU Libraries) on the Open Folklore project. On a day in which SOPA and PIPA were prominent points of discussion, in a moment in which there are powerful interests also pushing the terrible Research Works Act, and on the day that the Supreme Court handed down a decision that signs off on a law that allows works to be taken out of the public domain and moved back into copyrighted status, I am proud to be a member of the AFS Executive Board working with colleagues who share a commitment finding pathways forward toward the full realization of open access scholarly communication in the public interest. Thank you to the Association for Computers and the Humanities for its leadership and for drafting an excellent position statement. Thank you to the White House for soliciting input on this vital public issue. The Stop Online Piracy Act (SOPA H.R. 3261), the Protect IP Act (PIPA S. 968) and the Research Works Act (H.R. 3699) are terrible proposed laws that, if enacted, will greatly harm the public interest. If I can make things work, Shreds and Patches will be offline tomorrow (1/18) as part of the wider SOPA Blackout. Get online and learn more about these proposals and their likely impacts. Here is a video to get started with. Association of American Publishers Issues Horrible New Press Release in Support of a Horrible Bill: Where Do You Stand? This is just the latest in an endless, dispiriting series of commercial publisher FUD campaigns and efforts at the further corporate enclosure of public resources. Advocates for the public interest in scholarship will resist H.R. 3699 and those with vested profits in the terrible status quo will support it. As with FRPAA, as always, a key question is where will the scholarly societies stand? Another is whether any more academic authors and editors will wake up and consider their role in the perpetuation of a system that is not only dysfunctional but also increasingly corrupt and immoral. Money in politics? Corporate personhood? Policies that harm the poorest and help the most affluent? Academic authors–many of you are not connecting the dots that lead to your own practices. Another question is where do those AAP members that are not-for-profit university presses (Chicago, California, Hawaii, North Carolina, Illinois (sigh), Texas, Tennessee) stand? Is the AAP speaking for you on this one? Don’t forget PRISM, y’all. In the current context of global protest, economic failure and political transformation, anthropologists of many backgrounds are finding their voice and addressing the critical issues of the moment. For those with jobs that are being given the speedup treatment, it is hard to keep up with all of the thoughtful and provocative work being created and shared (especially online) right now. The evocative opening line of Jason Antrosio’s recent essay “Anthropology, Moral Optimism, and Capitalism: A Four-Field Manifesto” hints as the gestalt. A spectre is stalking Capitalism–the spectre of Anthropology. All the Powers of Capitalism have bound themselves in a crusade against this spectre: the Florida Governor and the U.S. President, Dominique-Strauss Kahn and the IMF, Wall Street and Congress. My thanks go to everyone who is tracking, discussing, fostering, and hosting these discussions. I hope other key nodes in the conversation will forgive me if I single out the Neuroanthropology bloggers Daniel Lende and Greg Downey for their vital work. Open Access Week and Occupy Everything both continue and I still cannot muster time to read or say much. Rex Golub at Savage Minds is right when he observes that I always bury my lead. He might also note that I say everything too obliquely. So, for tonight, here is a restatement of my previous post in less opaque language. Going forward from here, if your anthropological research tells you that large corporations are part of the problem, then please do not publish your discoveries or your proposals on this point in books and journals published by large corporations. Want to process the current moment of social protest and global revolution? Want to discuss the prospects for a human economy? Have stories, questions, fears or hopes to share? Does this moment speak to the concerns of our field? Does our field have something distinctive to offer those seeking social and economic change? Interested folklorists are invited to gather for a lunchtime discussion of such themes. In the spirit of the current protests, we’ll find our path to open-ended conversation in an informal way. Think of it as a potluck, but for ideas, comments, and questions. Everyone is welcome, even those who just want to listen. Bring a box lunch if you want more than food for thought. This gathering has been organized quickly, informally, and unofficially, but has been put together in consultation with leaders of the AFS and in collaboration with its Politics, Folklore, and Social Justice Section. The New York Times is reporting that the American Folk Art Museum in NYC will probably go under. This is mainly about financial issues, both the larger economy and mismanagement, but there is also an intertwined intellectual one and this can be seen clearly in the NYT story. Billie Tsien, an architect who designed the new building, said the museum’s capacity to raise money was in part limited by its subject matter; New York’s movers and shakers do not tend to collect quilts and weathervanes. The American Folk Art Museum has been pretty consistently hostile to the field of folklore studies–those scholars who actually study the vernacular arts of the United States, the Americas, and the world in context. On intellectual grounds, this day could have been foreseen long ago. That the architect who designed their (former) brand new building understands the museum so narrowly to be a thing of quilts and weathervanes speaks to how out of sync with contemporary folk art scholarship the museum was. There are no shortage of potential donors interested in folk art in New York City, its just that their folk arts of interests were not central to the agenda of the museum. On more than one occasion, American Folk Art Museum staff told graduate students with whom I work that if they wanted a real museum job working with folk art they needed to get degrees in art history, not folklore studies. Well, those students are doing just fine and are studying and working with folk arts and artists everyday while the American Folk Art Museum is going under. Financial foundations are important, but so are intellectual ones. An elitist art history was not the best platform upon which to erect a museum nominally dedicated to the arts of diverse peoples and communities. I am not against art history, but I am against an art history that is opposed to folklore studies without even knowing what the field is about.